It seems that Askja volcano is warming up. Literally. According to news on Morgunblaðið web site. The Askja volcano lake is now ice free. But that is highly unusual event. But normally during this time of year it is frozen over. In the news it is explained that this might be because the south wind in Iceland during the past few days, or the most likely second option. 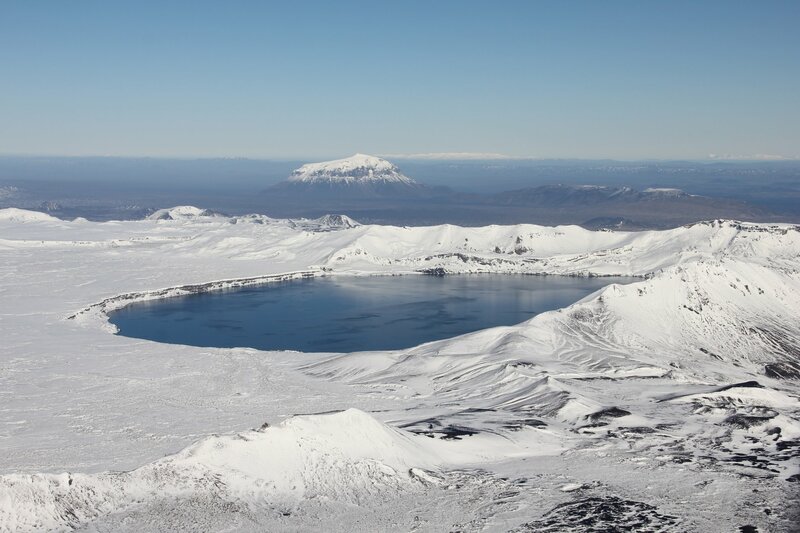 Askja volcano lake is now ice free because of more hydro-thermal activity in it. But that is seen as more likely option, as Mývatn lake, that is at considerable lower altitude is now frozen over. There was done a air survey with thermal cameras to see if there was any increased heat on the surface. So far that is not the case at the moment. But it might well be that the hydro-thermal areas under Askja lake are getting more active an warmer. At least that is the only explanation that makes logical sense to the scientists according to this news report. But while the surface activity is none. The chance is that at the bottom of the lake it is getting really hot, and that in turn warms up all the water mass in the Askja lake. But this means that the energy output from the hydro-thermal areas is already high. Even if it is not visible at the surface of the lake. Askja lake is around 220 meters deep. It was formed in large eruption in the year 1875 (VEI=5). But that was an caldera formation event that took place. But where Askja lake is now, it used to have a mountain that was in decent high before it was blown up into the air. At current time there is no new hydro-thermal activity in Askja volcano (around the lake). Besides the one reported in Askja lake. But based on recorded history, that might change soon. But it seems that before an eruption in Askja volcano, hydro-thermal activity increases in Askja volcano. But that means new hot springs, geysers and such. With all associated dangers and smells from sulfur. At current time, there is no risk of imminent eruption. As the activity at this moment suggests this is just starting, a long more might need to happen before an eruption. But that might change without warning as always. Since all volcanoes are impossible to predict what happens in them. Askja volcano has been having slight increase in earthquake activity during past few months. That suggests new magma is flowing into Askja volcano. But that earthquake activity has somewhat stopped completely and activity has quieted down from what it was few months ago. Update 1: Here is a new picture of Askja volcano. Taken by Ómar Ragnarsson retired news reporter from Iceland. He also has a new image from Kverkfjöll volcano here. Update 2: Iceland Meteorological Office has issued a press release about Askja volcano. It says that Askja lake is now ice free (same as in other news). The coast guard did go to check Askja lake on 2nd April 2012 with thermal cameras. In that trip it was discovered that Askja lake is completely ice free with no floating ice in it. The known hydro-thermal areas that are known where well active according to IMO. But no new areas of hydro-thermal activity where spotted in this flight over Askja volcano. Iceland Meteorological Office is going to increase surveillance with Askja volcano and to watch for future progress on what might happen in Askja volcano in the future. News about this in Icelandic. Use Google translate to scare the Easter Bunny. 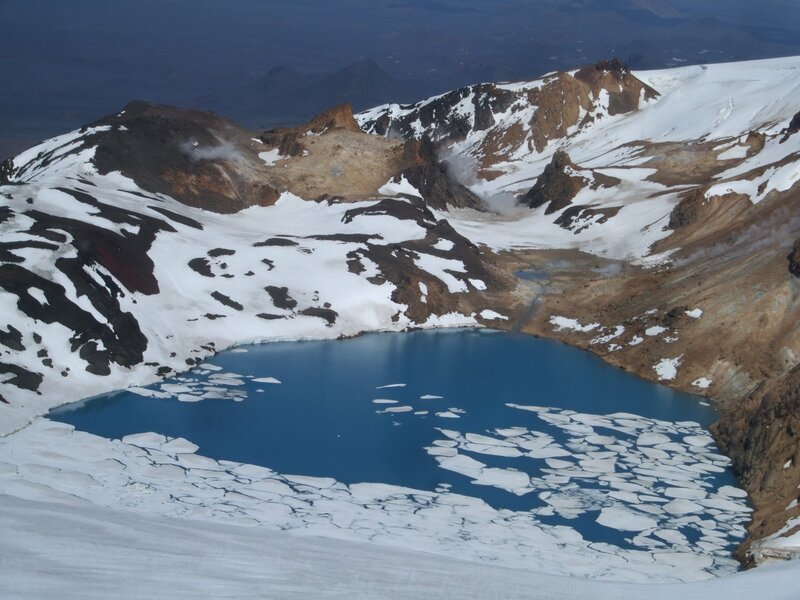 New pictures of Askja lake are in both news. Showing it completely ice free during the winter. Pictures are taken on 18th and 27th of March. Iceland Meteorological Office has MODIS picture of Askja volcano that clearly shows how ice free Askja lake actually is. Blog post updated at 01:32 UTC on 03.04.2012. Blog post updated at 01:45 UTC on 03.04.2012. Blog post updated at 16:32 UTC on 03.04.2012. Blog post updated at 16:48 UTC on 03.04.2012. This entry was posted in Askja, Hydrothermal, Magma, Monitoring, Volcano. Bookmark the permalink. Interesting development. I’ve noticed many earthquake swarms in Askja since I’ve been visiting this blog, (the opening stages of the Eyja eruption.) Askja has often been more shaky than Katla! It is clear to me that Askja is an active volcano, and is probably in the process of filling its magma chamber. Do you have access to any GPS measurements of the area? Interesting. It is questionable however, that this lake is expected to be layered. It COULD be, but that would imply gasses are building up, and the lake sometimes, caused by a disruptancy, turns over, just like lake Nyos is Cameroon. Since I do not know of this to have happened before, I doubt it will be the case now. That’s why I doubt it. This layering is needed for your story to be true, in my opinion. The IMO data from BRUJ and GFUM stations is showing nothing, historical displacement is available in final results but appears to be somewhat out of date. Whilst there is activity at Askja it does not appear significant on paper, however if IMO are doing flyovers to check on thermal activity then I must assume they have data they are not sharing? It is a pity they do not disclose more of what they are finding, an informed public are better prepared than last minute preparations. A lake of this volume and shape can store a great amount of thermal energy. My first thought was, that if the summer had been unusually hot and the winter unusually warm the thermal battle around the 0°c on the surface of the lake might be shifted rather significantly in time. Two things have discouraged this first thought. Conclusion, I wouldn’t go swimming in Víti any time soon. You forget ONE very important thing, Gummih: do not (never) look at just the lake. That there is no ice-cover at this moment does not tell that much (however unlikely it may seem). What DOES is that Myvatn IS frozen (As Jon mentioned). Myvatn, somewhat less inland as Askja region is always a bit less cold than Askja, so, that is a bit strange in this matter. You always need a reference, Myvatn lake provides us with just that. There is another indication that warm weather in unlikely: The complete area is covered with snow, as you can see easily on the air images. If warm winds would cause the lake to thaw, they would also thaw snow in the area – or at least reduce it. much faster then (thick) ice! Jon, Katla is now with cloud so dark, left corner. Blog post has now been updated with new information from Iceland Meteorological Office. Jon, I think we can figure this out easily. First, February and March were, as you probably know, warm months, with temperatures mostly above 0ºC. Temperature was often around +7ºC over Askja, when gale southwest winds; these winds are katabatic because they warm after passing over Vatnajokull and descending downhill to the north of the glacier. Second, Myvatn might be frozen now, but the temperature there was -15ºC yesterday, so that makes sense. It would be good now to know if Askja lake is frozen or still unfrozen. Also, it might be good to know if, before this cold moment, if Myvatn was frozen or not when Askja was photographed (on the 27th March). We can only compare the lakes on the same date. If Myvatn is frozen on the same day as Askja is unfrozen, then we know that it is geothermal activity the responsible for it. Askja was virtually unknown until the tremendous eruption which started on March 29, 1875. Especially in the eastern fjords of Iceland, the ashfall was heavy enough to poison the land and kill livestock. Ash, or tephra from this eruption was wind-blown to Norway and Sweden. The eruption triggered a substantial wave of emigration from Iceland. Another less well-known eruption occurred in the early Holocene, ca 11,000 years ago. Tephra from this eruption has been found in south-east Sweden, Northern Ireland and north Norway. The last eruption of the Askja was in 1961. The outer caldera of Askja, representing a prehistoric eruption, is about 50 km², and there is evidence of other later caldera-forming events within it. The main crater floor lies at about 1,100 m.
In June 2010, Volcano expert Hazel Rymer said seismic activity was increasing at Askja and that an eruption could be around the corner The increased earthquake activity is located to the northeast of the central volcano, in the direction of Herðubreið. It was ruled out that any activity from Eyjafjallajokull was responsible for the increase in activity at Askja. The news came as scientists continue to watch Katla. Öskjuvatn is a large lake that fills much of the smaller caldera resulting from the 1875 eruption. Its surface lies about 50 m below the level of the main crater floor and covers about 12 km². When the lake originally formed it was warm, but today it is frozen over for most of the year. Öskjuvatn is the second deepest lake in Iceland at 220 m deep. The secret to predicting a volcano’s eruptions may lie in its plumbing. New research looking at volcanoes in Iceland and the Afar region of Ethiopia — the two areas where mid-ocean ridges, where Earth’s tectonic plates are moving apart, are visible at the surface of the Earth — found that the underground caverns holding a volcano’s magma aren’t buried as deeply as scientists had thought. These caverns, called magma chambers, also swell, shrink and pulse every now and then, yielding possible clues about the size and timing of a volcano’s next big eruption. “The study shows that the deep magmatic plumbing of each volcanic segment, as well as the numbers of individual magma chambers and their connections, is more complicated than we expected,”said Carolina Pagli, a geologist at the University of Leeds in England. Pagli led one of two studies on spreading-center volcanoes published this month in the journal Nature Geoscience. … For example, the ground started uplifting (elevating) four months before a 2008 eruption in Ethiopia, because an influx of new magma increased pressure in an underground chamber. An increase in earthquake activity was another signal, Pagli said. … feeding the 2008 Ethiopia eruption lie only half a mile (1 km) below ground. Earlier models had assumed those chambers were more than 2 miles (3 km) deep. Whatever happens is going to happen. Regardless of that eventuality, we ought to be able to see those events develop quickly over a very human and watchable window of a year or less so. What is the prominent peak in the background of the picture listed in Update 1? That is Herðubreið. But that is a volcano cone that formed around 12000 years ago. It erupted under a glacier and created this form following that. Is it possible to get a longer time frame of this chart? Hard to tell if the current spike up is significant. The current changes in the tremor plot are just bad weather. New blog post is up about Askja volcano.